Vacation and I have a love hate relationship. I love planning and getting ready for vacation, I even enjoy traveling to my vacation destination more so now because my son loves to fly. So you must be saying what is to hate about vacation; well after about day two I become home sick, tired and just want to go back to the comforts of my normal environment. Who wants to live out of a suitcase for a week or more, certainly not me three days is my limit. Well taking all that into consideration I was a little apprehensive about this vacation. But I must tell you I have learned that the reason I normally get home sick and generally cranky on vacation was because of boredom. On this vacation I had so much fun and did so many things that I did not get bored or cranky until day seven of my nine day vacation. - Visited my maternal grandfather (learned that good life choices is key). Met a lady that was apart of my life story even though I do not have any memory of her ( granny Weg). Hang out with my cousin, Mom, Dad, my son and my mother's friend and eat fried fish with bun (Jamaican fruit cake). My son picked and ate so much star fruit I was surprise he didn't start looking like a star. All in all it was a very enjoyable day. 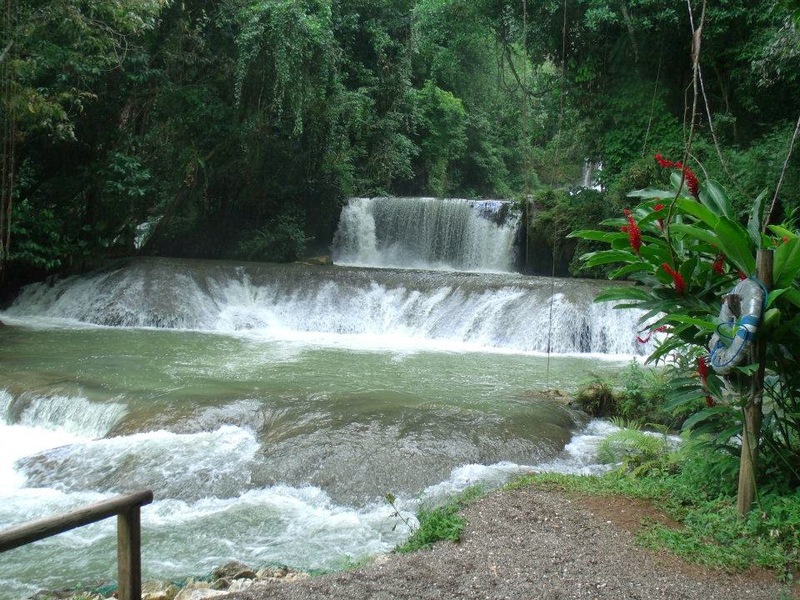 - YS Falls in Middle Quarters, St Elizabeth Jamaica is plain beautiful. Spent a day there with my sisters, my son, my niece and my dad. Swinging from ropes (am no Tarzan) falling over rocks and oh did I mention climbing up flights of steps to get to the falls. After an wonderful day enjoying nature went ate pepper shrimp, jerk chicken and festival, roast fish, shrimp fritters, shrimp soup; oh the joys and bellyful. - Spent time on our own private beach (yes we have our own private beach) collect rocks and shell. Say what! you asked. Yes collecting rocks and shell because my sister and son feels we need to take rocks and shells home. -The highlight of my trip was shopping for Ettenio products (yes I did). I bought one of each item that the had at Young's Pharmacy in May Pen Clarendon. I will certainly catalog my use, likes and dislike of the products I got from the Ettenio line ( a natural product hair care line made in Jamaica). -I spent three bliss fill day with my paternal grandparents ( my second parents). Spent hours having conversation with grandfather about the past, about life. Some of these conversation where eye opening, some humorous and others were informative. My Mum (grandmother) is suffering from the dreadful disease called Alzheimer. I had to constantly remind her who I am and who I belong to but I am still grateful. Why you ask; because she mobile and can still attend to her day to day activities with some help and also because when I tell her who I am her eyes light up and she hugs an kisses me as if she hasn't seem me in awhile. _ Finally. I was a time well spent and I do appreciated all the people to time out to help me enjoy my vacation especially my dad and my sisters. Vacation was great and I'm looking forward to my next great vacation.